Camellias are the aristocrats of the garden. They stand majestic, wrapped in rich green and glossy leaves all summer, and then when winter comes they burst into bloom, bringing exotic forms and rich colors to the garden when most other flowers have finished blooming. By choosing several varieties, it is possible to have camellias in bloom in your garden from fall to spring, in an ever-changing kaleidoscope of richness. Yet these are not difficult plants to grow. Yes, they have some basic requirements, but if these are satisfied they will grow with no trouble into mature specimens, living for decades and becoming better and better all the time. Camellias will grow from zone 7 and into warmer zones, so they do well in the south and in California. They do best in partial-shade, in soils that are rich in organic matter and slightly acidic. If your soil does not match this, the easiest way is to grow them in pots in lime-free potting soil, which also means, with a little winter protection, they can also be grown further north. Camellias have many uses in the garden, and they fit with many garden styles. In the West we usually think of Japanese gardens as gravel and rock, with maybe a twisted pine and bamboo. 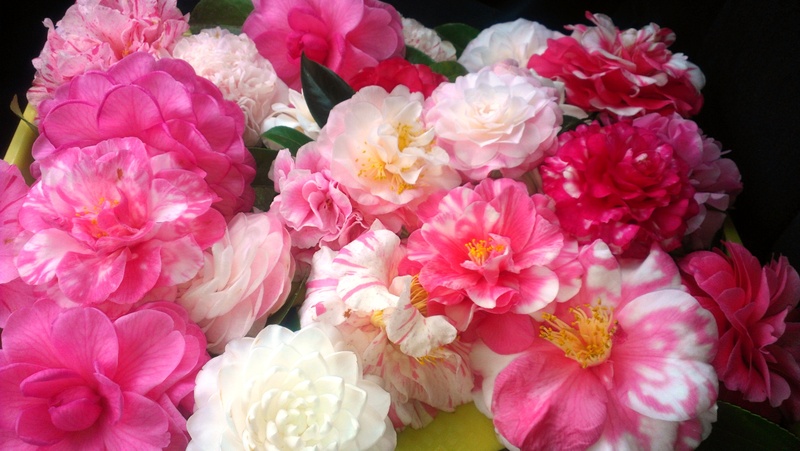 In fact, Japanese people love flowers just as we do, and camellias have been favorites for centuries. So if you have an Asian-style garden, camellias fit right in. They also grow well and look stunning in woodland gardens. There, in the partial-shade from trees overhead, they thrive, and add interest and color to a collection of rhododendrons and azaleas, that enjoy similar conditions. The slightly formal, upright look of many of these plants also fits well into more formal gardens, in beds edged with boxwood, or paired on either side of a doorway. For a private gardening joke, grow the beautiful ‘White by the Gate’ camellia beside the gate into your garden. Camellias make great screens and informal hedges. Many will grow up to 10 feet tall, usually enough height for screening, and since they are evergreen the screen is always solid. They naturally grow densely, so little or no trimming is needed. That wall of blossoms in winter will be a spectacular addition to your garden. Camellias grow well in containers and pots. Their fibrous root-system adapts well to pots, and they will live in them for years. This means they can be brought into highly-visible spots when in bloom, and put into less prominent areas for the rest of the year. Of course, their foliage is so handsome you will probably want to always keep them prominent, to give structure and form to your terrace or patio. These plants originate in China and Japan, and can be found all through Asia and into Indonesia. There are around 200 species, but in our gardens we usually grow two or three, and hybrids of them. Of course that doesn’t mean we have no choices, because each species has hundreds of different garden varieties – cultivars – that come in many forms and colors. They also bloom at different times, so knowing the species helps you choose ones that will give you flowers in several seasons. With such a wide range of forms, there are Japanese camellias for every taste. As for color, all possible shades between pure-white, cream, pink, and the darkest reds are found. As well, there are exotic forms with white or pink petals splashed with darker pink or red, often with every flower turning out differently. Blooms last a long time in the garden, with the cooler winter weather, and they can be brought inside and dropped into a bowl of water, where they will last for days and days. This species, Camellia sasanqua, is similar to the Japanese camellia, but the bushes are usually more open in form, faster growing, and ‘softer’ looking in the garden. The big difference though, is in the flowering time. Sasanqua camellias begin to bloom in fall, and are often completed by Christmas, just in time for the earliest Japanese camellias to begin blooming. So they extend the camellia season by several months. Most are single or informal semi-double, and the flowers are a little smaller, but they are profuse bloomers. Some plants often sold as this type are actually hybrids, called Camellia x hyemalis, like the beautiful and vigorous pink called ‘Kanjirô’. These are a cross between a sasanqua camellia and a Japanese camellia, and usually also bloom in fall, but often over into winter as well. Yes, that cup of tea you just had is the leaves of a camellia, Camellia sinensis. This bush just has small white flowers, but it is grown commercially, particularly in China and India. The leaves of the Sasanqua Camellia can also be dried and used to make tea. No matter which kinds of camellias you grow, you can be sure to have a great winter, watching them bloom, and revealing once again their spectacular beauty.